These are muted Bobwhites and ideal for dog training and/or hunting preserves. 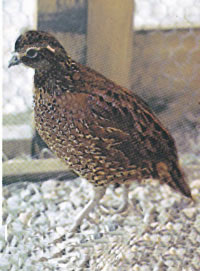 VERY aggressive and cannot be raised with other quail or game birds. They whistle like the bobwhite but are red in color with black dots. Shipped April through September and sold in lots of 100 chicks only. How much space is needed for 100 of these birds? Brooding quail chicks: provide 1 sq ft per 5 chicks for first 2 weeks; then 3 chicks per sq ft until 6 weeks of age. After 6 weeks, 2 birds per sq ft.
How long does a red quail take to grow to maturity and can theses reproduce if left to mature? Tennessee Red Quail mature @ about 16 weeks and start to lay at 20-22 weeks. Tennessee Red Quail are very aggressive birds - do not put them with any other type of quail or breed.